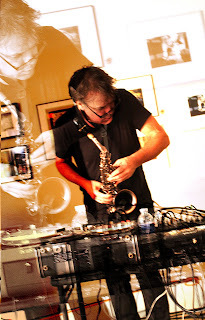 Thanks to Eric Hardiman for shooting and posting videos from Saturday’s Albany Sonic Arts Collective show. This is the premiere of a soon-to-be-titled work built around the idea of treating a fader box as a set of pump organ pedals, rather than simple position sensors. Using Cycling ’74’s Max I can control the organ sounds with a variety of gestures: “pumping” the faders makes the sounds louder, rhythmic motion creates harmonics, sudden and abrupt changes add distortion and bite. The samples that appear at 5:30 are from a 2010 recording session with choreographer Jill Sigman (previous story here). “No Mule” is another brand-new tune. The rhythmic chopping effect is a kind of slow-motion walk through a live sample of the banjo. I add a few more live samples beginning at about 4:00 and get into full-on Steve Reich mode by 6:00.